Fish number density can be estimated from the normalized second moment of acoustic backscatter intensity [Denbigh et al., J. Acoust. Soc. Am. 90, 457-469 (1991)]. This method assumes that the distribution of fish scattering amplitudes is known and that the fish are randomly distributed following a Poisson volume distribution within regions of constant density. It is most useful at low fish densities, relative to the resolution of the acoustic device being used, since the estimators quickly become noisy as the number of fish per resolution cell increases. New models that include noise contributions are considered. The methods were applied to an acoustic assessment of juvenile Atlantic Bluefin Tuna, Thunnus thynnus. The data were collected using a 400 kHz multibeam echo sounder during the summer month of 2009 in Cape Cod, MA. Due to the high resolution of the multibeam system used, the large size (approx. 1.5 m) of the tuna, and the spacing of the fish in the school, we expect there to be low fish densities relative to the resolution of the multibeam system. Results of the fish number density based on the normalized second moment of acoustic intensity are compared to fish packing density estimated using aerial imagery that was collected simultaneously. 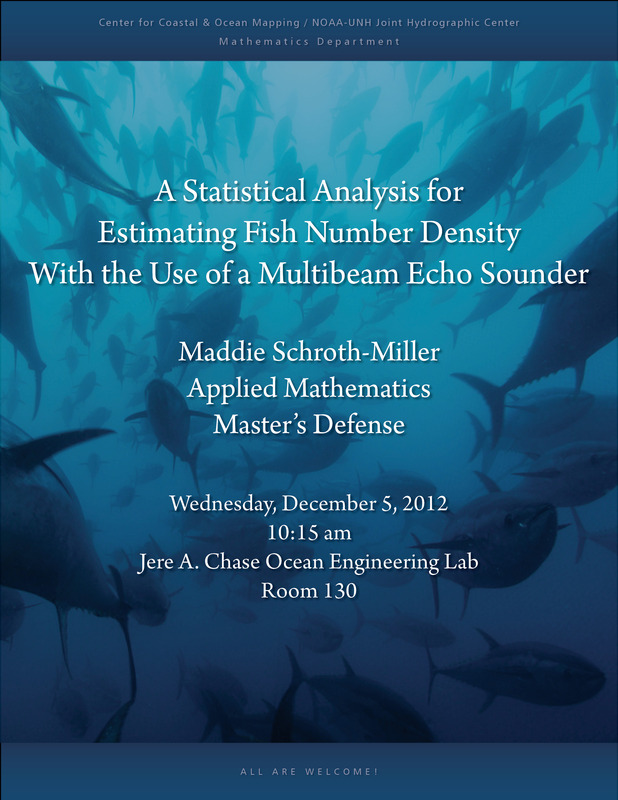 Maddie Schroth-Miller is an Applied Mathematics Master's student at UNH. She attained a B.S. degree in Mathematics at Cal Poly - San Luis Obispo. She is interested in studying marine mammal acoustics and social behavior. She has a wonderful boyfriend, Hunter, who is very supportive and an amazingly happy golden retriever named Jake.